Winston Churchill knew the power of words. In speeches, books, and articles, he expressed his feelings and laid out his vision for the future. His wartime writings and speeches have fascinated generation after generation with their powerful narrative style and thoughtful reflection. Martin Gilbert, Churchill's official biographer, has chosen passages that express the essence of Churchill's thoughts and describe-in his own inimitable words-the main adventures of his life and the main crises of his career. From first to last, they give insight into his life, how it evolved, and how he made his mark on the British and world stage. Being an Indian, ever since my childhood I have heard only bad things about this man; and with all honesty almost all of it is true. He was directly responsible for a devastating famine in India during the war. But as I grew up, I understood that the situation was beyond his control. He was leading a war against tyranny and his interests lied in victory of his country. Every human being is flawed and they take wrong decisions and in this case we were in the wrong side. So I thought of learning a bit about his life and works and purchased this book. The first good thing is, the organisation of the materials. It's like a journey through the life of Churchill rather than a boring documentary. Every section has an introduction to what follows, to put things in the right context. As you keep reading, you will see a certain new character trait of Churchill which he developed from a certain experience. Churchill's writings are sharp and clean and the author of this book has done a great job in sketching a brief picture of Churchill's life. The second second is History: I learned a lot about the world the world history by reading this book. Whenever I found anything that I have not heard before, I just went to Wikipedia and learned about that chapter of history. To cut the long story short, this book tells you a lot about Churchill's life and his journeys. A well read man who had travelled to far corners of the world and had all sorts of experiences. I thoroughly enjoyed this book and learned a lot from it. I would advise the reader to go slowly through the book and use the internet to find more information about any incidents that she/he is not aware of. It might improve your history by a significant amount, at least it did for me. Martin Gilbert is the foremost expert on Churchill in the world, beginning his work for Randolph Churchill on the biography in the early 1960s and taking over at Volume III upon Randolph's death in 1968. If there is anyone qualified to do this work,it would certainly be Sir Martin. It is a good work in one volume and the author presents his choices of WSC's speeches and writings through his years. Of course you can buy multi volume works of his speeches but this book relieves you of the brunt of the weight and provides you the best. While I am familiar with many of his most famous, there are many very interesting parts in here, for example "The Supreme Hour", when Winston had to tell the House of Commons that on July 4, 1940, the French fleet was sunk by His Majesties Ships and 1,297 French sailors were killed. How do you bear and bring this horrible news? England had watched France cave in to the Nazis and now he has to tell the House that the Royal Navy had to sink a large part of the French fleet. This was when England stood alone and things were bleak indeed. The power of his argument and presentation is brilliant and this one I had not come across before. There are others of interest that I won't spoil, but what a master of words he was. In some ways the book is like a box of fine chocolates. You really don't want to sit down and digest it in one sitting but it makes for a very interesting repast when you have a little time and want to go exploring with WSC again. 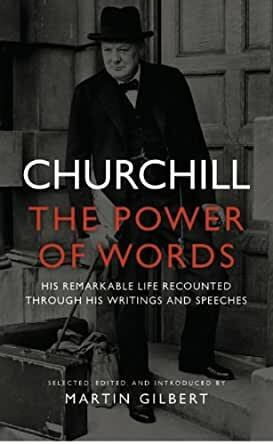 This magnificent work by Martin Gilbert shows Churchill's life through his speeches and writings, placed in chronological order, with constant reference to Churchill's age. It is striking to note that his life had long moments of apparent political stagnation, periods in which he was demoted or reduced to playing a subordinate role in England's political affairs. But is also remarkable that he never gave up, never lost his supreme self-confidence. Ever since he was a school boy he seemed certain that he would play a huge role in the history of the nation. At 22 he became famous when he escaped from the hands of the Boers. His descriptions of the River War against the Derviches are very powerful. He would have to wait until he was 65, an age at which most politicians are thinking of retirement, to play his most stellar role as Prime Minister during the II World War. His leadership made a big difference in its outcome. And he did it through the power of his words.President Kennedy said it beautifully: "He mobilised the English language and sent it into battle". Excellent book. The editor obviously respected Churchill and has carefully selected gems from throughout Churchill's life to inform the reader about the man and his times. Martin Gilbert is not only a great biographer and scholar, but an incredible teacher.